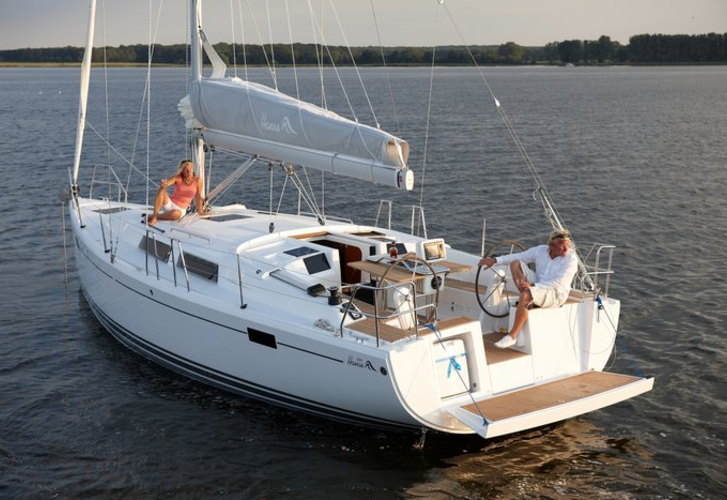 Yacht Hanse 385 called Anahera was produced in 2014. We offer this sailboat from base Portocolom in region very close to Mallorca. Anahera is certified for 6 pax. Layout of the vessel is 6. Hanse 385 Anahera has 3 bedrooms. For comfort of passengers there are 1 WC with showers. You can fill the tank for fuel with 160.00 l liters and in water tank it goes even 320.00 l l. With motor 20.1 kW Anahera can navigate really fast. Anahera is 11.40 meters long and 3.88 m wide. Draft is 1.99 meters. Read about other yachts in this site: Yacht charter Portocolom. Sailboat's equipment consists of : Bimini top, Teak cockpit, Anchor electric windlass, Autopilot, Gps plotter, Ipad, TV, Coffee machine, Inverter 12v-220v, Internet Wi-Fi, Furling mainsail. . Security caution has value 3000.00 EUR. Choose our offer and have fun on the deck of Anahera. This Hanse 385 from Portocolom from Balearics You can analyze in this section: Yacht charter Balearics.